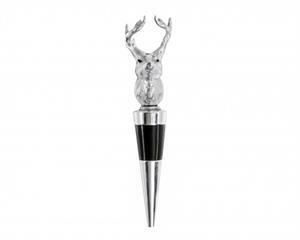 Decorate your favorite wine with this Antler Bottle Stopper from Arthur Court. Perched atop the stopper, the elk head's serious expression gives this item a commanding and distinct presence. Handcrafted in sand-cast aluminum, this stopper makes a great gift for the wine enthusiast in your family.